Racers, start your engines! This big rig race obstacle course will have your heart pumping and engine racing. Two competitors head to the starting line. 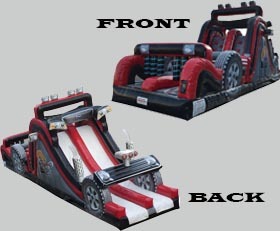 In front of them stands an enormous course of big rig themed obstacles, including: jump through, climbing walls, and slides. Great for all ages. A must for any event.